The third and final day was crucial as well. The main task was to put together bits and pieces and design the future scenario for this large partnership on rural radio. The day before, each group had chances to meet and discuss. Not so much as we hoped at the beginning but enough thanks to all the activities in preparation for the group work. It was also clear that the participants had different expectations and attitudes, in terms of decision making and future relationships. 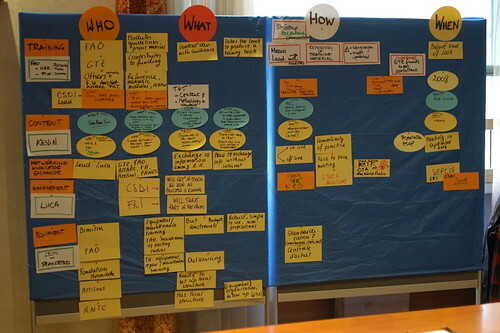 We started from collecting the WHOs, WHATs, HOWs and WHENs from the facilitators of the single groups, defining in this way a potential common and general plan of action. The panel in the above picture describes better than words the complexity and the vast range of activities that we agreed to bring ahead. 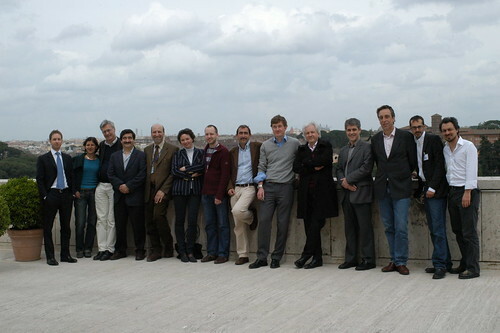 Interesting to note that most of the people present in Rome agreed on starting activities as soon as possible and on scheduling a new meeting, probably in September 2008, to discuss more in details the plan of action for the future collaboration. At the end of the meeting, after discussing the vision of the group for the future and before the final statement, we had an EVALUATION session. 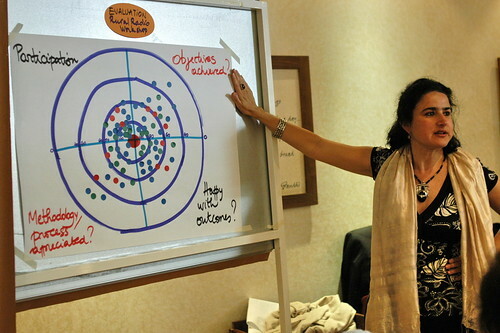 Sophie, the morning facilitator, asked the participants to define their satisfaction in terms of Participation, Objectives achievement, Methodology and process, Outcomes, and provided them with “bullets” to stick on a dartboard. outcomes were satisfactory for four/fifth of the participants. From our point of view, the result we were aiming at were largely reached. 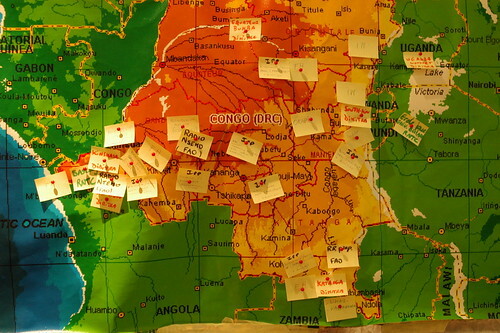 We were aware that many different partners are working in DR Congo but we didn’t have details about these activities. Thanks to the gathering process we started online and the face-to-face meeting, we could draw a much clear map of what’s going on in DR Congo and the Great Lakes region on Rural radio, and the way we all can collaborate by existing points of contact. Obviously this kind of meeting had also other good aspects, like eating together and talking freely about many different topics we share. Categories: reports, social media | Tags: Africa, capacity building, collaboration, communication, development, facilitation, knowledge management, knowledge sharing, lessons learned, network, rural radios, support, web | Permalink.